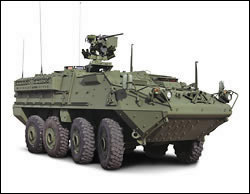 New combat vehicles such as Stryker are part of the U.S. military's bid to transform itself into a faster, more mobile fighting force to deal with new threats around the world. At the same time, the U.S. military is increasing funding for advanced unmanned systems to use on the ground, in the water and in the air, spurred on by an American public that is less willing to accept the death of U.S. troops in battle. The U.S. Army plans extensive tests at its Fort Bliss, Texas, facility next month of the robotic Strykers, which can each carry two soldiers who can control up to 10 additional unmanned air and land vehicles from their three-screen command centers at the back of each vehicle.